Often, there is data in other sources that needs to be imported into Enterprise Vault that can't be done with the standard tools supplied. 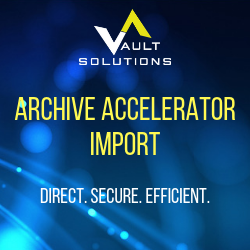 With this feature of Archive Accelerator, Vault Solutions has developed a snap-in mechanism to allow importing of data from virtually any source. The Vault Solutions Importer can be used to immediately start importing data from a data source, or can import data on a schedule. It keeps chain of custody information about all items imported. It keeps track of what has been imported to insure against re-importing the same data twice. It can be set to automatically delete imported data after a set period of time. The importer can be used to bring data directly into Enterprise Vault from other vendors data ingestion products. All imports are done via a windows service, and controlled via a Microsoft Management Console interface. SQL is used to track and record all imports. Items which fail to import are recorded, and once the issue has been resolved, can be easily re-processed. The Vault Solutions Importer is installed on the Enterprise Vault server, and does not require additional hardware. It works with Enterprise Vault 8 through 12.